The overall proportion of U.S. women who used a method of contraception did not change between 2008 and 2014, according to a new study by Guttmacher researchers Megan Kavanaugh and Jenna Jerman, just published in Contraception. In 2014, as in 2008, 60% of all women and 90% of women at risk of unintended pregnancy reported using some method of contraception. The authors analyzed 2008, 2012 and 2014 data from the National Survey of Family Growth to determine contraceptive use overall, as well as the specific methods women were using in each of those years. Although overall use did not change over time, the authors did observe changes in which contraceptive methods were being used and by which groups of women. The largest increase in use among types of contraceptive methods over the six-year study period was seen in long-acting reversible contraceptive (LARC) methods, including the IUD and implant; these methods were used by 6% of contraceptive users in 2008 and 14% in 2014. 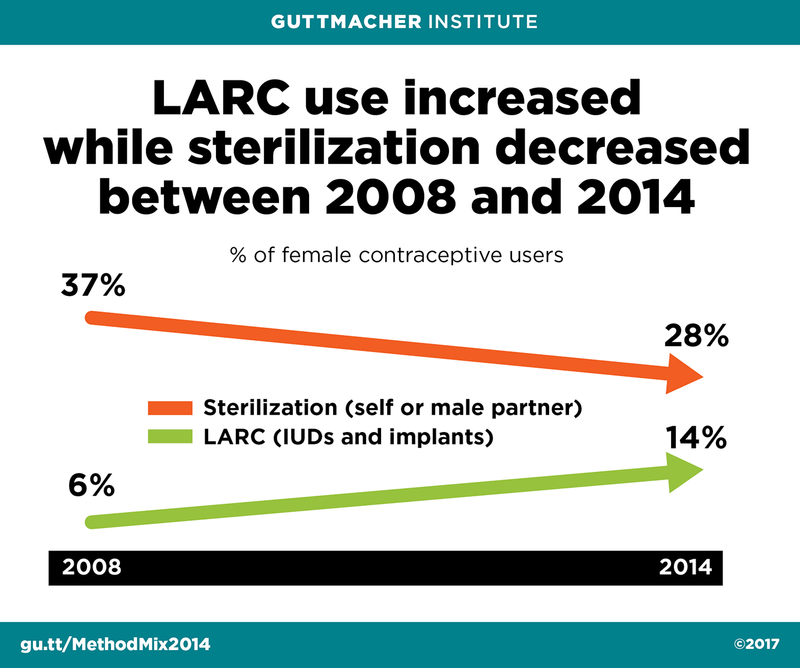 Permanent methods of contraception, including female sterilization and a male partner’s sterilization, saw the largest decrease in use, from 37% of contraceptive users in 2008 to 28% in 2014. Among women aged 20–24, who account for one-third of all unintended pregnancies, LARC use increased without a proportional decline in sterilization. The authors also noted a significant increase in the use of withdrawal as a primary method of contraception, particularly among higher income women, white women and those born outside of the United States. Kavanaugh and Jerman note that some women may prioritize other factors—including personal autonomy, user control and sexual acceptability—over effectiveness in their choice of method, and they emphasize the importance of considering the user’s priorities first when recommending a contraceptive method. The characteristics of various contraceptive method users also changed during the study period. The increase in LARC use was observed across almost all demographic groups, and as a result, LARC users were more heterogeneous in 2014 than in 2008. The decrease in use of female sterilization was primarily driven by lower income women, while the decline among women relying on a partner’s sterilization was primarily driven by higher income women and those who were white and married. The Affordable Care Act’s (ACA) contraceptive coverage guarantee was implemented between 2012 and 2014; however, there was no significant increase in the use of methods that would have been covered under the guarantee during this time. The study authors point out that prior to ACA implementation, many women were able to access contraceptive methods at low or no cost through publicly funded family planning centers and the Title X program. The coverage guarantee may have enabled these women to obtain contraceptive services and supplies using private insurance coverage, rather than continuing to rely on scarce safety-net resources. “Contraceptive method use in the United States: trends and characteristics between 2008 and 2014,” by Megan L. Kavanaugh and Jenna Jerman, is currently available online and will appear in a forthcoming issue of Contraception.